The Frentani were a group of Italics who, during the Iron Age, were located in the hilly country of the modern region of Molise, on the Adriatic coast immediately north of the Gargano promontory. They were neighboured by the Dauni to the south, the Pentri and Carracini clans of the Samnites to the west, and the Paeligni, Vestini and Marrucini to the north. Their language came from the Oscan-Umbrian group of Indo-European languages (P-Italic), which were widely spoken in Iron Age central and southern Italy before the rise to dominance of Latin (Latin itself was a slightly more distantly related language, coming from the Indo-European Latino-Faliscan group, or Q-Italic). The Frentani people (not to be confused with the Ferrentani) formed part of the Oscan-Umbrian group. For some of their existence as an identifiable clan, they formed part of the Samnite confederation. This was a loosely-knit grouping of four clans: the Carracini, Caudini, Hirpini, and Pentri (the most important of the clans). The Frentani seem to have joined the Samnites as the confederation expanded its territory towards the Adriatic coast, but later Roman intervention drove them apart again. According to Strabo, they were originally a Samnite people, but it seems that their location allowed them to act independently, and for the most part they were seen as a fully independent people (as were the Lucani, another former Samnite clan). They generally had much more in common with the minor peoples to their north, the Marrucini, Paeligni, and Vestini. Probably by this period the Frentani have occupied the territory in the modern region of Molise, on the Adriatic coast, immediately north of the Gargano promontory. Their migration there seems to detach them from the main Samnite body, so that they are recognised as an individual people. 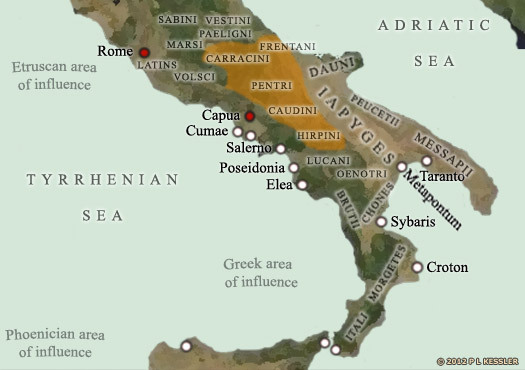 Ptolemy and Strabo, both writing in the first centuries AD, set the Frentani borders at the River Sagrus (modern Sangro) in the north, but Pliny has them (almost) as far as the Aternus. This gives them a large chunk of the Sagrus' northern bank, and puts them up against the Marrucini and Vestini. Pliny would seem to be more accurate, as the settlements of Anxanum (modern Lanciano) and Ortona are both to the north of the Sagrus and both are Frentani, and Ptolemy also claims Anxanum for them. To the west they reached as far as the foothills of the Appenines, where they buffer the Carracini clan of Samnites. The Second Samnite War is triggered against Rome, and the Samnite commander, Gaius Pontius, leads a force of around 9,000, including a thousand cavalry, with which he wins several early victories. The Frentani receive their first direct mention in history in 319 BC, at which time they are allied to the Samnites in the fight. However, they are quickly defeated and submit to Rome. When the Samnites are finally defeated in 304 BC, their confederates, the Frentani, Marrucini, Marsi, and Paeligni, voluntarily accept their reintegration into Roman administrative rule. All the other Samnite allies are also subjugated by Rome. In fact, the Frentani seem to be politically connected far more closely to the Marrucini, Paeligni, and Vestini than with the Samnites by now. Pyrrhus of Epirus sides with Tarentum against Rome, as do many of the southern Italic peoples, including the Brutii, Lucani, and Samnites. A few years later these three Italic tribes send auxiliaries to the army of Pyrrhus, while Rome has its own loyal Frentani auxiliaries (or, more probably, the subject Ferrentani of Campania). The Frentani have remained true to their alliance with Rome, and perform with distinction. Following the withdrawal of Pyrrhus in 278 BC to conquer Syracuse, the Italics face Rome's might alone. The Second Punic War is fought against Carthage. Rome is aided by its Etruscan, Picene, and Umbrian forces, but Italy is invaded by Hannibal Barca and a Roman army is massacred at the Battle of Cannae, killing 60,000. A greater part of the Italic peoples go over to the side of Carthage, but again the Frentani remain true to their alliance. Probable commander of the Frentani. With most of the Italics defeated, only the Samnites stand against Rome, so the latter agrees concessions to end what may be a prolonged conflict. The Italic tribes are granted the Roman citizenship which had previously been withheld from them. Thereafter, they are gradually absorbed within Roman Italy and lose their individual identity.